The waterfront part of the City of Surrey is one of the last industrial sites in Metro Vancouver. With the SkyTrain as a major transit route and the new construction of the Pattullo Bridge, there is huge potential for redeveloping Surrey’s waterfront area. The project focuses on the area around the Scott Road SkyTrain station, which is proposed to be a transit-oriented development. This is where the City permitted a new arena and new amenities to be built. Based on the existing context, this project takes advantage of transit and waterfront views and transforms it to an attractive urban village. 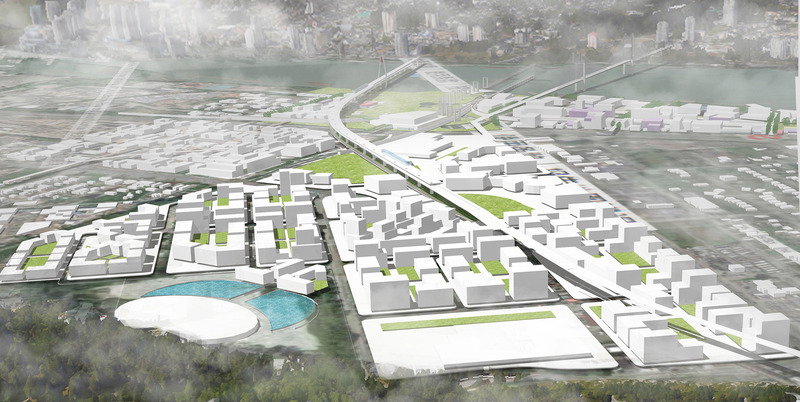 The site can be split into two parts: the institutional part along King George Boulevard and the mixed-use part around the station. By keeping and expanding CDI college, this place can become the learning centre for workers. The mixed-use area will be dominated by mid-rises and a high street to connect the station and new arena. Taking economic viability into consideration, there are three options for density. The “base” starts with 4- to 6-story buildings at a net FSR of 2. In this option, streets and courtyards are hardly shaded. By adding several 8- to 12-story mid-rises on the base, the density can reach 2.3. The mid-rises are located at street corner to avoid shading public spaces. Finally, by adding towers along high street, density can be increased to 2.5. This creates a dynamic skyline for the site and offers great waterfront views.